Home › Promotions › Brake Fluid Awareness Month! How Often Should You Change Your Brake Fluid When You Ride Near Dallas? Check your manual, but most bikes need brake fluid flushed and replaced at least once every two years regardless of mileage. Why? Because brake fluid absorbs water over time, lowering its boiling point and increasing the risk of internal corrosion. If you ride the streets of McKinney, Prosper, Lewisville and beyond, make sure your brakes are in top shape. 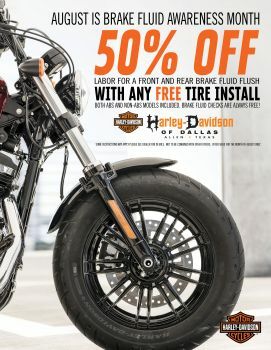 For the Month of August get 50% off labor for a front and rear brake fluid flush with any FREE tire install. Both abs and non-ABS models included, Brake fluid checks are always FREE! Schedule your service today!